We’ve taken our popular Oak ICE™ collection and added it to our women’s line. Our durable Old Town leather looks great with anything. Leather lined with cushioned comfort throughout and our tough ICE™ outsole make this one to own. I am wearing a pair, that I have worn for 8 years. Every day wear on farm and riding. Still great shape. I just ordered a second pair for fear of not being able to get them later. I had ordered the wide, but they are still to tight. Just ordered my second pair of these boots. The first pair have been through rain, snow and much abuse. They have held up remarkable well and I'm so glad I found a pair of riding boots that are comfortable and well made. I've worn these boots 4 times a week for 16 months. They are extremely comfortable and fit true to size. They were a bit snug until they were broken in, just like any other pair of leather boots. I'd buy them again! These are comfortable well made boots. I only buy shoes/boots Made In USA which Double H are. The toe was a bit more pointed looking than the pic showed but still OK. I would recommend these boots to others. This is the second pair of Double H I've bought for my wife. She loves them. The first time I bought them for her from shoeline they were to small but you can't beat the easy return and exchange. The shipping was very fast to. Ordered them on a Tuesday got them that Thursday. 2 days. I recommend shoeline. I have had these boots for almost 2 years and absolutely love them! very comfortable, stylish, and very very durable. I had to replace the heels once but no big deal. Will probably buy the same pair when I wear these out. Made in USA! Love these boots! Comfortable to wear around the ranch all day! I bought a pair of Double H Boot Women's 12 Inch UltraGel Buckaroo boots 7 years ago, and they are still my favorite pair of boots! They have taken a beating! The sole finally came off one boot which is why I decided to purchase another pair of the exact same boots! I LOVE THESE BOOTS, they are so comfortable, tough, and basically require no to little break in. I ride horses, use them as work boots for work and wear them out to town, they are plenty comfortable to work all day in and do lots of walking! Lots of walking from day one...no breaking in required! Wear a size 8-9 and found 9 fit just right. I just looooove them - prefer them over my expensive custom mades. The feel, the looks and they last forever. Sole doesn't wear off - amazing. I am getting my 3rd pair. Absolutely recommendable - sturdy, no wet feet. I LOVE this boot. I'm looking for one in BLACK or some thing very close to it in same DOUBLE-H brand. Best boot I have had. Love these boots! Most comfortable ive ever owned. Im always on my feet and working with animals large and small and im never worried about being stepped on! I LOVE LOVE LOVE these boots!!!! They are comfortable, especially with the gel inserts, extremely well-made, very good-looking, and perfect for riding my horse! I only buy boots made in the USA and this is my first pair of Double H boots, but I know I will buy more boots from this company because they are wonderful. I like the thick soles and the rubber soles/heels---they won't slip or wear out quickly. After reading the other reviews, I ordered a half size larger than my usual size (8 instead of 7.5), but my usual width (W). They fit perfectly and, the more I wear them, the more the gel forms to fit my feet. I highly recommend these boots and I was very happy with the quick and free delivery from Shoeline. I ride a Harley street glide and need a boot with grip! Luv that I can keep my cowgirl ways on my Hog! They do run one size small and narrow so do order a full up and wide. Luv the American boot company! I ordered a size 8.5 wide and had to send the boots back twice to get them to fit (10.5 W). But, I loved the ease and timeliness of the returns..you were very patient and I ended up with a great pair of boots! Thanks! I would definetly purchase from your store again. Love them. The price was right the size was right and they tokk only a few days to receive. will shop with you again. This boot is extremely comfortable but does fit one whole size smaller or for me it did anyway. Excellent quality boot. Love them. customer service was great recommended it with enthusiasm. I love these boots After reading the other reviews I ordered a 1/2 size bigger wider. The fit was perfect. I couldn’’t ask for more out of a boot made in the USA. The best point for me was the arch support. Great boot and comfy too. Just what I was looking for. The tops of the boot is so narrow it is very hard to get your foot in Sending these back. Best boots I ever had. Fit great and very comfortable. Would recommend them to anyone looking for boots. Shoeline is a great place to purchase footwear. I found that this boot fit a bit short a size 9 was just barely long enough. love that they are made in the U.S. please make some in black. .this is the first of 3 pairs of double H boots i have ordered. well made. very comfortable. received them 4 days after ordering. I ignored the comments about getting the boots 1/2 size larger wider. I wish I had listened. The boots are great but...they DO run small narrow. I have never had to go up a .5 size in boots and medium width always fit. I’’m sure it is due to the extra gel padding. I do advise to go up a 1/2 size and the width too. Otherwise they are great boots. the return process is easy. Great Boots looks awesome on my big foot. I LOVE THESE BOOTS. They’’re comfy cute and came broken. I’’ll be wearing these in my wedding and for a long time after. I did follow the advice from other reviews and go a half size larger than normal. I usually wear a 7 and the 7.5 fits perfectly. These boots are beautiful but they fit SMALL...I’’m not even sure if they are a full or half size small on me. I returned them but I may re-purchase them in the future in at least a half size larger. I could tell the boots are very good quality though and seem like they would be very durable. I wore these boots only twice so far and they are very comfortable. Got them on christmas. I got compliments on them both times. They are rugged and cool looking. Great arch support which is ultra important to me. The leather is the type of leather that is distressed and sort of changes in shade of color. But in a good way. Color was a bit lighter than expected but I still love it. I love them. My friend loves many things I do and I knew once I walked in her home she would like them too. I was right. 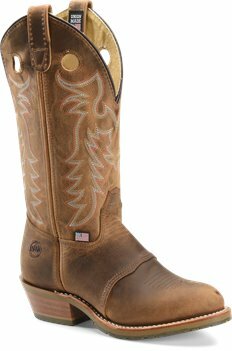 This is a great work boot and riding boot.Best of all it is American made.Fits great right out of the box and Shoeline has great customer service if you don’’t get the right size the first time. Brand new out of the box these are comfortable. Terrific all ’’round boot and "made in the USA" makes them even better Worth the price. These boots are very comfortable and look great with anything. I would absolutely recommend this product. It is the most comfortable and best fitting boot I have ever had. Fast delivery easy exchanges. Great call backs from company with pleasant people. I had one foot ever so slightly over the line in width don’’t be like me and fudge. Get the wider size. I had to exchange. Very very Nice Boot well made. They run narrow for a 9W. I am returning for a 9.5W will check those out when they arrive.. The boots are very comfortable I can wear them all day. And they look great too. I am also very happy with the customer service at Shoeline. I have a very hard foot to fit. Narrow in the heel and wide through the ball of the foot. I had to go a half size larger than normal for toe room but found the boot to fit very comfortably though I have not had a great deal of time to wear them. I plan to use them to ride and everyday wear when not at work. This is my second pair of these boots. I absolutely LOVE them They are so comfortable I didn’’t want to take them off. I was having a problem with an arch on one foot and I don’’t have any problem now. No pain at all Love them. sizing seems off had to take a half to full size larger to get the right fitsizing is often off with cowboy boots but other than they are great. good quality of leather and workmanship and they feel great on easy to be in all day. Boot fit short. Had to order next size up.Very comfortable for all day wear. Love the color. Luv them So comfortable. The leather is tough and durable but smooth and flexible. The inside soles are soft and mold to feet after less than an hours wear. 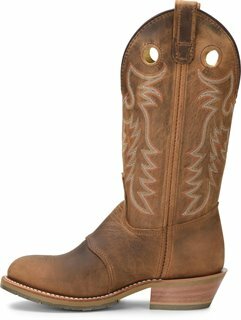 Very content with purchase and would recommend to anyone looking for a high-quality and stylish pair of cowboy boots. well made boot and very comfortable. should includes instructions for taking care of the boot. i had to send an e-mail to customer service.